Anyone use any Hantek Scopes? I have a DSO-3064. I've had it 5-6 years & use it all the time. 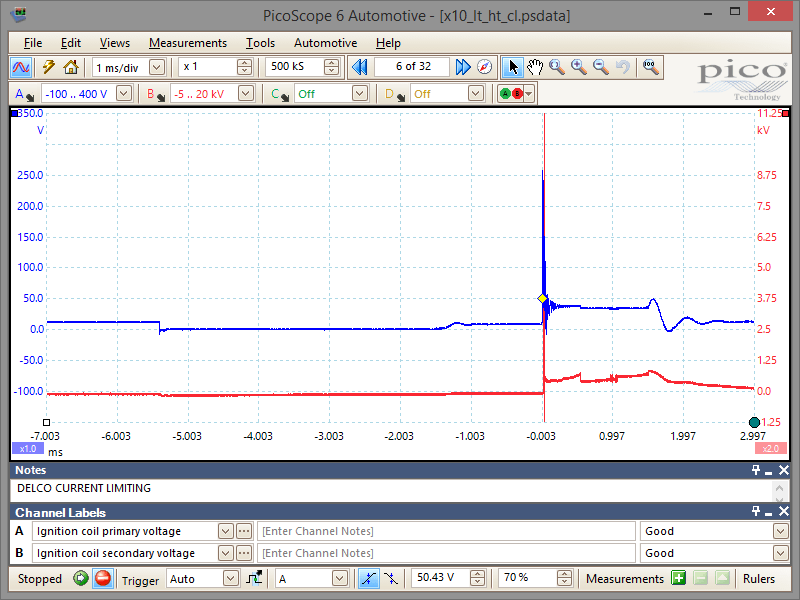 Scope works fine, the software has a lot of room for improvement & hasn't been updated for years. My neighbor picked up a 6074 scope earlier this year & it had issues. The longer it was used, the more it would bog down the computer. If it was on for more than a few hours, it would eventually lock up the computer. He gave it to me for a few days & there were definitely issues with it. I believe it was a defective scope & he ended up returning it. I tried to get him to pick up another one, but he is looking to buy a better scanner now. The 6074 scope has a lot better spec's than the other scopes Hantek is marketing now. The 1008 & 6022 scopes are very entry level scopes, and are not recommended (at least by me). I believe the 6074 is the new, 4 channel automotive scope & is the replacement for the older 3064. If you don't have $2500.00 to spend on a Pico (and who does), pick up a 6074. Just make sure you get it from a reputable seller & that you have return options. If my 3064 died today, I wouldn't hesitate to pick up another one tomorrow. I keep a Hantek 1008 in drawer case I need more than 2 channels. In terms of bang per buck as starter scopes Hantek offer a lot but the Windows software is a bit of a pain to use. Also the build quality is variable on both the scopes and the amp clamps. I own two of their amp clamps one works fine the other arrived broken and I had to spend two hours fixing it to get it to work. If buyimg again I would just buy generic amp clamps. Also the mhz performance claims on all brands of Chinese scopes is has to be taken with a large pinch of salt for example Hantek claim the 6047BE has a bandwidth of 70mhz but in the documentation the band width limit is 20mhz and that is likely to actually be 20/4 = 5mhz as it shared between 4 channels, this is actually more than fast enough for nearly all automotive purposes but keep in mind to turn off channels you don't need. I have been considering the Hantek IDS1070s Wifi scope which is a non-automotive scope --I have dabb;led with Wifi scopes last year I used a Velleman WTF210 for a couple of months I actually liked it a lot , great build quality and windows and Android software was easy to use but was prone to crashing and didn't show pre-trigger events which is very important for some car diagnostics. 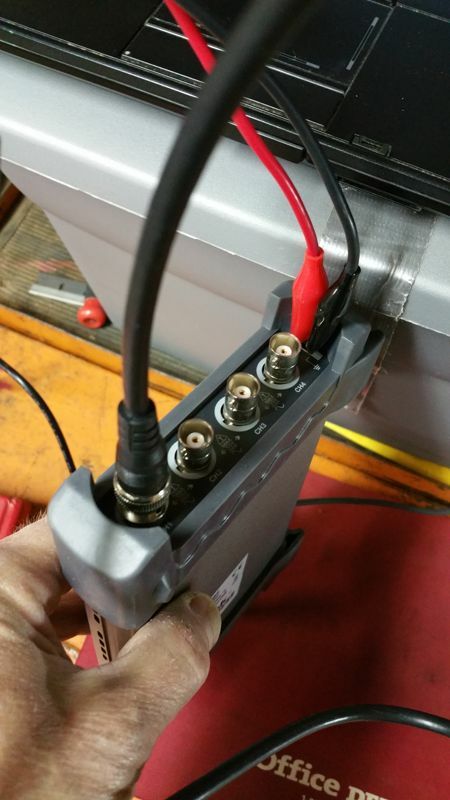 With these non-automotive scopes it is important to porotect the scope by using an attenuator when connecting to coils and injectors. I own a Hantek 1008c and while it's passable, I wouldn't recommend it. In general, I find you can't practically use more than two of the channels. If you're on a really tight budget, it would be better to get the two channel 6022, as it's higher bandwidth and there is also decent third party software for it, openHantek or sigrock. If you can afford a little more I think I'd recommend the 6074 also. I haven't used it yet, but I just ordered one myself and it will be here in a few weeks. I can let you know how it turns out if I remember. Hi, first time poster here. I bought the 6074be and thought some initial comments/waveforms might be helpful to others that are on the fence. I don't have enough experience with DSO's to make qualified judgments but my initial impression is I was hoping for more. I'll attach some of my first waveforms. They look to be kind of raw (unfiltered?) compared to even the AES Wave handheld dso used by Paul in a recent misfire video. I'm open to instruction and advice. 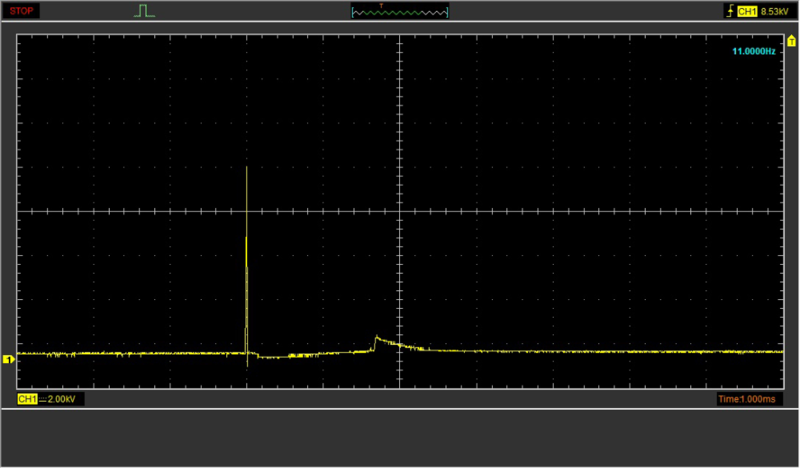 The attached waveforms are single triggered events. I read somewhere the Hantek software behaved better if you start capture by clicking Auto button, so I did. 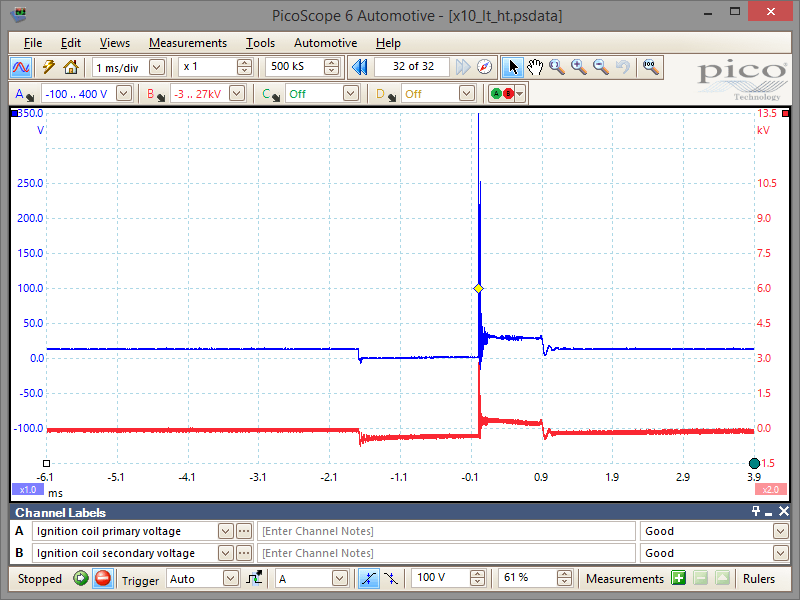 I adjusted voltage and timebase the best I could. My setup was the dso outside of the engine compartment and the ground leads clipped on engine ground. The HT25 was used for the secondary captures and the CC-65 is clamped on the ground wire at the distributer. Engine is 2000 Honda Accord 2.3. There is a known misfire on #4 cylinder ("secondary-bad" attached image) The other "secondary-good" image is clamped on another spark plug wire. I can still return this scope and I"m trying to decide if I should stick with it or try something else. You need to run the calibration after the scope has been turned on a while and warmed up. I've been playing with my hantek 1008c and the ht25 and cc65 and I'll probably post about my experiences. One thing you could do is use video capture software, I use the free version of debut video capture and record the secondary vs primary waveforms on the same screen. I'd be curious what result you get. 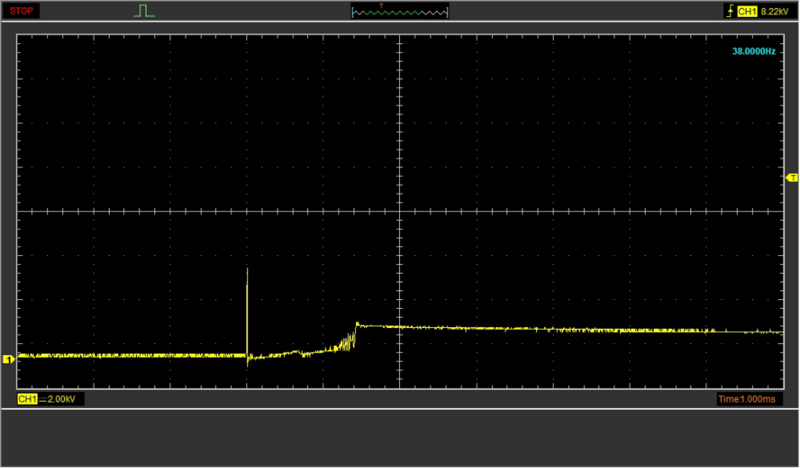 On my 1008c the ht25 waveform looks like crap compared to the primary waveform. Maybe I'll post some video links. I'm also just starting out and I actually ordered a 6074be which will probably be here in about two weeks. andy I have that scope I bought afew months back havnt used it yet since I picked up a snapon modis. I comparing that to the 4 channel pico automotive scope, they state 400ms/s realtime samples. wht is the the hantek?. and also the buffer on hantek ? compared to the pico ? I think the HT25 is probably just a crappy secondary pickup. I'd appreciate your feedback. 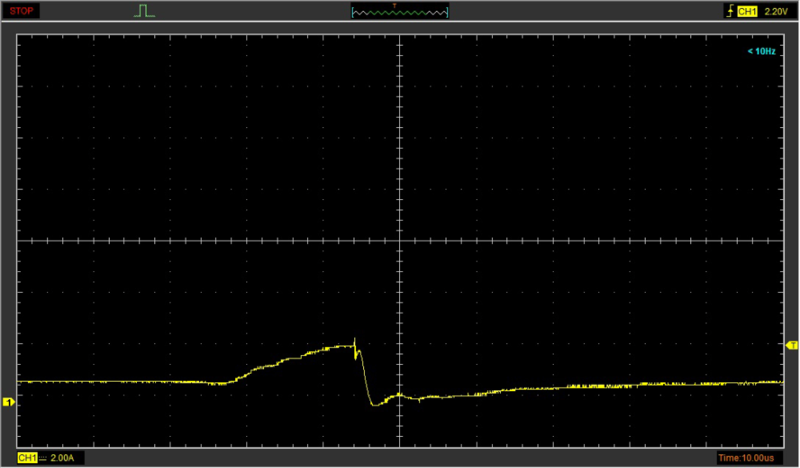 Here are some results looking at the primary ignition waveform and current ramp. The trick with the cc65 is that it accepts interference from the environment, so you have to hold or set the body of the cc65 as far away from the coil as possible to get a clean signal. Also, don't forget to let the scope warm up and run the calibration routine. Wow, nice waveforms SailorBob! If I could get that quality I'd be a happy camper. 217oldtimer wrote: Hi, first time poster here. I bought the 6074be and thought some initial comments/waveforms might be helpful to others that are on the fence. I don't have enough experience with DSO's to make qualified judgments but my initial impression is I was hoping for more. I'll attach some of my first waveforms. They look to be kind of raw (unfiltered?) compared to even the AES Wave handheld dso used by Paul in a recent misfire video. So in this picture, the Primary and Secondary are almost exactly mirrors of each other. However in this waveform we see the same kind of strange degradation we've observed in our personal measurements with the Hantek scopes and HT25 leads. This makes me think there is some other variable here, not related directly to the scope and lead we're using, but I'm not sure what it is. Also, I just ran across this post of mine from a little while back in which I had just got the scope and was playing around trying to get secondary ignition traces. What I noticed was that my waveforms were really clear and detailed. The difference was that I was just directly looking at the output of the HT25 pickup on a 50mV / div screen without using the 10,000x scaling. I think the software scaling may screw up the appearance of the waveform. Maybe I'll post about this on iatn, and see if anyone can explain what's going on, or maybe I'll go out and see if turning of the 10,000x scaling and just reading directly in mV gives better results. Last edit: 02 Feb 2018 03:39 by SailorBob. Maybe I'm doing calibration wrong. Please have a look at my hookup. I used the included leads. I have my HT25 leads pulled up away from the engine but I'm not getting anywhere near the waveforms your seeing. I had a family rush job come in so I'll get back to the Hantek tomorrow hopefully and try your settings. The instructions say calibration has to be done when the ambient temperature changes more than 5*C, and you should let the scope run 20 minutes to warm up before doing the calibration. On my scope, it says to hook up all the channels being calibrated to a ground. I hooked both power and ground clips to my battery negative on all the channels I used and ran the calibration right before making this video.